1) Bouquet of red roses. 2) Ferrero Rocher Chocolate contains 8 pieces in heart box. 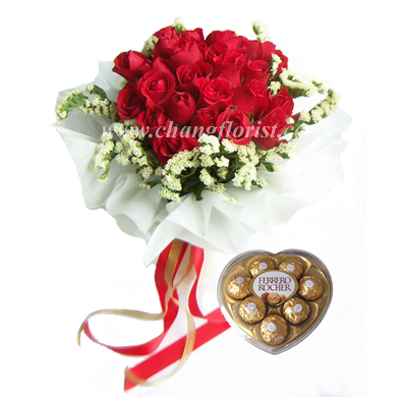 - This item is available for the delivery on Valentine Period in Bangkok only. For delivery in other cities/province, please ask us before placing order. - Pictures are only represented the product type. The actual products may be slightly different from the preview, depending on what is available at the local florist.